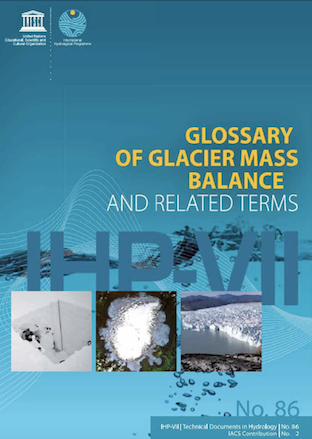 This glossary is a comprehensive update of glacier mass-balance and related terms including definitions of more than 400 terms. The glossary was produced by the IACS Working Group of Mass balance terminology and methods (2008 – 2012). The glossary has been published 2011 by the International Hydrological Programme of the United Nations Educational, Scientific and Cultural Organization (UNESCO-IHP), Paris, in the series of IHP Technical Documents in Hydrology: IACS Contribution. Hard-copies are no longer available. The glossary can be downloaded from the UNESCO website. Click here to get more info on the working group.